On guided excursions, our certified River King instructors will lead you upstream through beautiful natural environments to waterfalls and rocks where you can wade in the river, jump off rocks, and learn about the surrounding areas. River Tracing is a fun, safe, and exhilaratin activity that can be done by all people of any age and skill. No level of physical ability or technical skill is required. 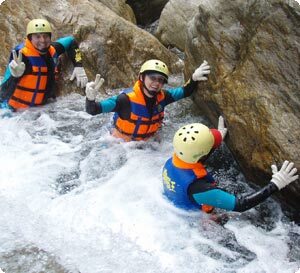 The activity combines both leisure and sport as it allows people to explore unique areas of Hualien and soak in Taiwan’s most beautiful attraction, its natural environment. The River King offers half-day and full-day tours to 6 different rivers that are less than a 20-minute drive from Hualien City. All our instructors are certified in First Aid, Lifeguard Training, Rift Water Rescue, and Risk Management. Price includes: tour, equipment (wetsuit, water boots, lifejacket, helmet, gloves), pick-up from any point in Hualien city, lunch for full-day tours, coffee and snack for half-day tours, tent to change clothes, digital photos, and insurance. Please provide your Name, Passport Number, Date of Birth, Weight & Height (for wetsuit size), and Shoe Size. A deposit of 30% of the total will be requested at the time the reservation is made. Bring a towel and a change of clothing. It is best to wear a swimming suit or under garments under your wetsuit. We provide a tent where you can put your wetsuit on. Wearing contact lenses is fine, but we strongly suggest wearing glasses. Please do not bring any valuables such as your wallet or camera. We take a digital waterproof camera with us on our tours so we can get the great shots of you and your group. These photos are included in the price and posted on the River King website. Prior to registering, please ensure you are not susceptible to the following: heart disease, asthma, epilepsy or pregnant. The day before the tour, get enough sleep, maintain a good mental state, and have a positive attitude. 1. Listen carefully to the instructions and safety precautions given by your River Tracing instructor. 2. Do not remove your helmet, life jacket, boots and other upstream equipment to ensure safety. 3. Do a warm-up exercise or stretch before the tour to avoid injuries. 4. Wipe any sand off your boots before climbing rocks to avoid slipping. 5. Follow the instructor upstream, always let the instructor be in front of you. 6. Follow the instructor’s guidelines at all times. There is not to be any climbing, swimming across the river, diving or other dangerous actions without the permission of the instructor. 7. Walk carefully from rock to rock to prevent falling down, don’t jump. 8. If you have any discomforts or needs, please feel free to inform the instructors and assistants to help you at any time. 9. We are only visitors to the rivers, please do not interfere with flora and fauna, or take away any of the plants and animals. 溯溪王 版權所有‧轉載必究 Copyright © 2015 The RiverKing All Rights Reserved.